We are a virtual airline, operating with enthusiasm in the realm of P3D, FSX and Xplane. 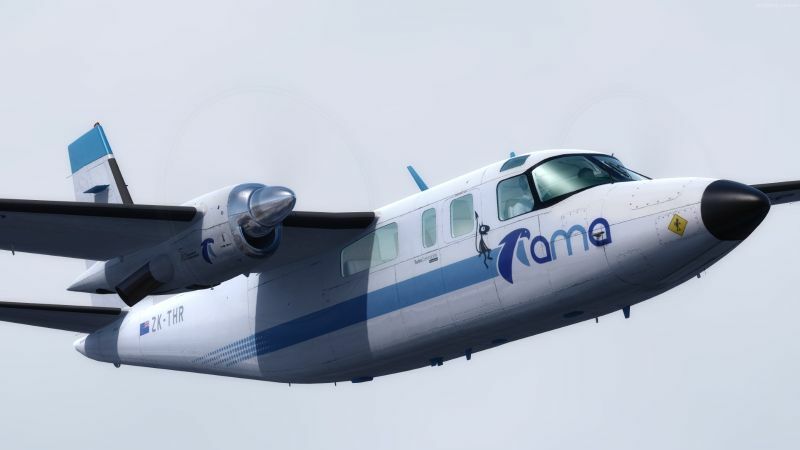 We have brought Andras Meridian Airlines from its start with three Cessna Skyhawks to a worldwide operating carrier. This means we have opened hubs all around the globe, connecting them in our ever expanding network. This doesn’t mean we will become a long-haul-only company someday. From our hubs, we will again offer smaller routes with smaller planes. Our fav planes will always be with propellers. Our preferred routes will always be flyable within 90 minutes. We offer routes in various parts of the world in a variety of aircraft types. Pilots can feel at home flying with us, from bush- or air taxi services to longer haul big iron. Our ranking system awards larger aircraft types in a broader network as pilots rack up flight hours in our fully automatic pirep system. Apart from what we want to achieve for the airline, we want to spread the love for flight simulation. This will always be an educative, friendly, helpful and caring band of enthusiasts. When time allows, our virtual characters will meet in the HQ for a chat or a beer (or more). And when we are online (flying or just “checking in”) we will be those who explain and help out. Quality over quantity – that’s what Andras Meridian is all about. Will you be our newest pilot? If you are interested, email us at ceo@andrasmeridian.com , or apply via our application page. 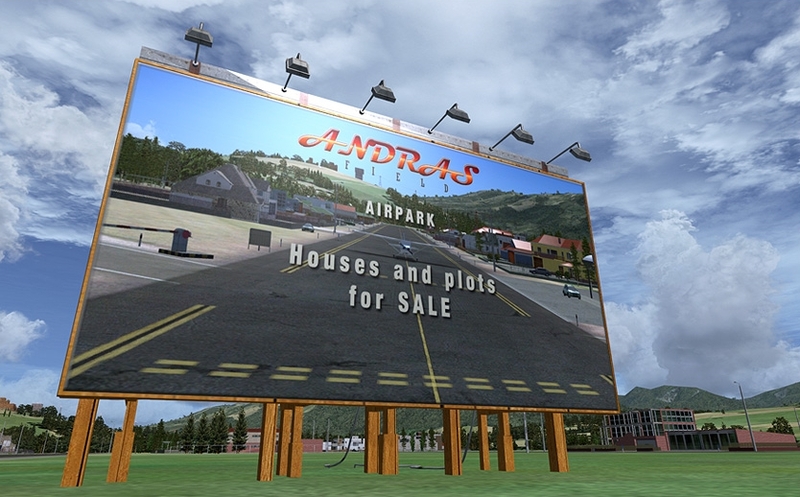 When Aerosoft launched Andras Field in 2010, it quickly became a popular field for people wanting a plot there, complete with house and hangar, making it their “home” in the virtual world of Flight Simulator. It did not take long for these people to start thinking about a virtual airline, operating from their own airfield towards outlying fields in Germany, Austria, Swiss and Italy. As we grew in routes and fleet, we started expanding to other hubs to open up more and more of the flight sim world. The status today is that we have fleet of ±150 aircraft, located on numerous hubs around the world, with a global network linking all those hubs together. From humble beginnings, we are truly a worldwide airline. We also boast our own liveries via inhouse repainters and some scenery addons for our hubs. To top it all of, we have a very active forum, are generally active online flying (although not as serious as you’d find on VATSIM or IVAO) and generally host or join-as-a-group some kind of tour or challenge once a year. We can even do flying lessons should you wish; all in good fun and for the love our joint flightsimming hobby. Andras field is our birthplace and our namesake. 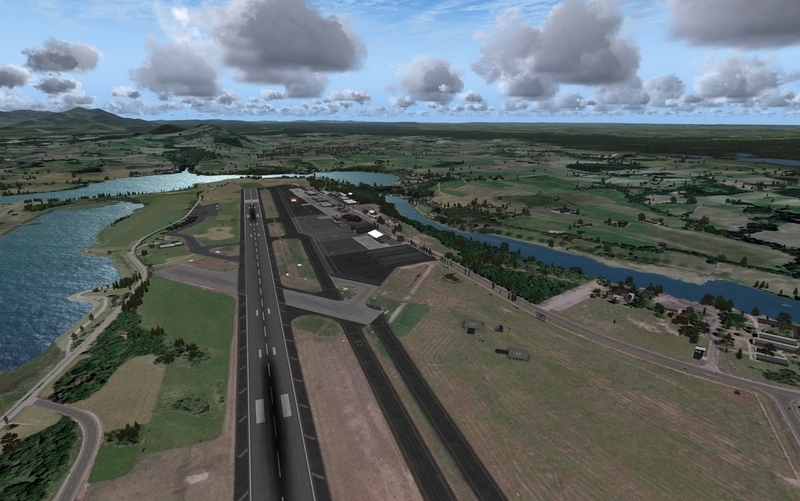 Andras Field is a fictional airport close to Castle Neuschwanstein located in the south of Germany. It was built on a WW2 airbase and features a long runway (good for large aircraft), a water airport for floatplanes and a smaller airfield for gliders. Andras Airfield has all facilities like fuel, hangars and lighting and is beautifully located near the alps. From Andras Field (EAFS) it’s less than 30 miles to Innsbruck (LOWI), and less than 60 miles to Munich (EDDM). Even Zurich Airport (LSZH) is in short reach. Andras Field has a wide 5000 feet runway suitable for heavy aircraft (it used to be a military airport after all), a 6000 feet water runway, helicopter landing sites and even a long glider grass strip. Both the seaplane base as the airport got hangar space for visitors and for larger aircraft based on Andras Field. 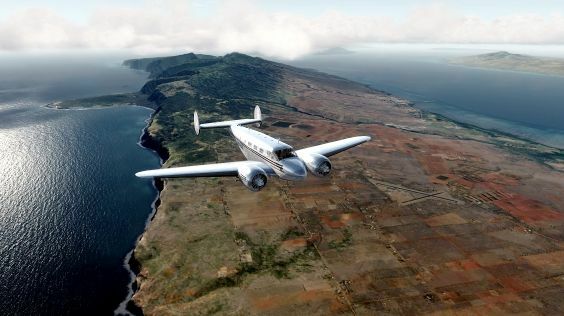 The project is very much intended to cater for all kinds of FSX flying. There is a lot to explore at Andras Field and the near surroundings, even after you used it for a long time you will still find new animations and new objects (also because the project will be updated very regular). Just pick a new parking or a new taxi route and you are bound to see new stuff. Andras Field is also the place where our internal developers will test out new ideas and technologies. For example in this first edition we have used MoCap (Motion Capture) to show a whole new kind of animation. From people having an heated argument to people that are dancing. Of course sound effects of all kind are used to complete this. And yes, Andras Field is a fictive airport. We wanted to create a new idea with new features and there just is no existing airfield that could bring what we needed. We needed artistic freedom to make this a very special place. We needed this liberty also so we could let the users create and manage this airport and all that comes with it. Aerosoft provides the base files and will change it continuously but the users will decide what is changing! You can buy Andras Field via Aerosoft, or find it for free on the aerosoft forum without the airpark. Adjacent to Andras Field is Andras Airpark, a community of flight enthusiasts. They reside there in their houses with their own hangars. The airpark is connected to the airfield, so they can bring in their GA planes to fly to work or just for leisure. Andras Airpark was built together with the reactivation of the airfield in 2004, and while it is a lively place already, some lots are still available for new resident. Most of our pilots own a house here, as you can see on the nameplates in front of the houses. 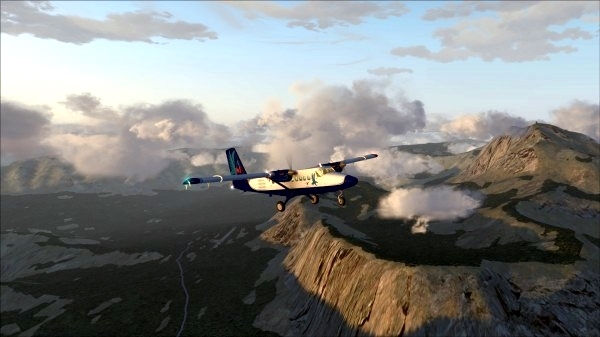 The airpark is only available by buying the Andras Field package from Aerosoft. For more information on Andras Field, go here. 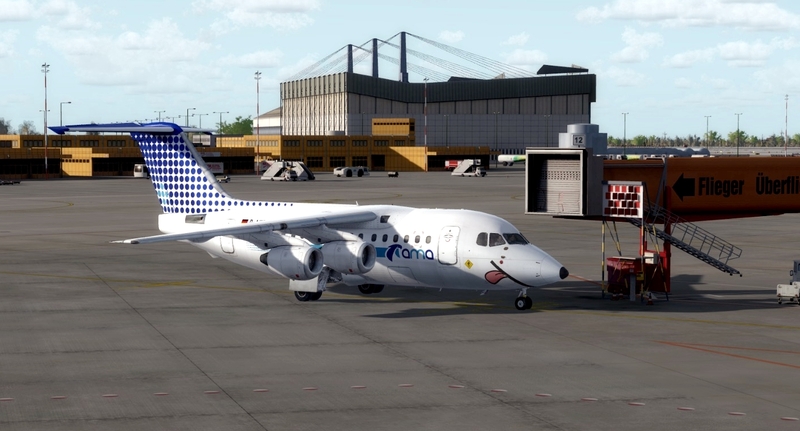 Another part of the world has been unlocked for you to fly your passengers and cargo around. This time not so much a bush character as Alaska and Papua New Guinea. No, this is the mundane scenery of Hawai’i. Airfields are more mature and decently paved here, the aircraft requiring some more luxury than the formerly mentioned regions. It is with great pride and pleasure that we present to you a new hub and network in the South Pacific. It is centred around the new hub AYMD, Madang. The main network lies in and around Papua New Guinea. Longer routes are currently set up to outlying island countries like the Marshalls, Tuvalu, Solomons and Tonga. In time, French Polynesia and Hawaii will be linked, branching out to and linking existing hubs in Alaska and New Zealand. 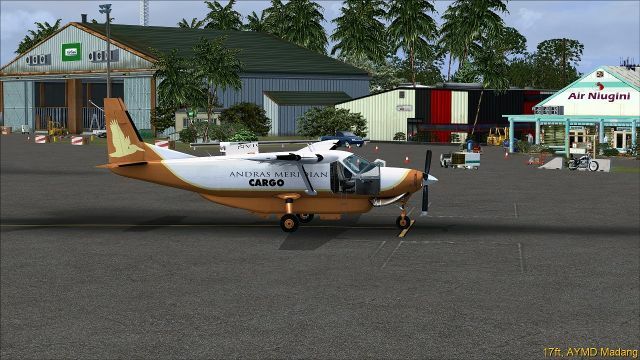 A trip around Papua New Guinea, hauling cargo around on our just delivered network. All pilots had to land at least once at all 42 predetermined airstrips, using an equal number of probation, charter and commuter aircraft. Scores were measured on speed and lbs of cargo hauled and averaged. The rules of Papua New Guinea Race can be found at the bottom of this page.